So this is an better-than-Raspi, which can run Ubuntu? If so … wow!!! For applications that can take advantage of multi-cores an ODROID-U is probably equivalent to 16-20 Raspberry Pi boards in terms of CPU performance. I think Hardkernel sells the board nearly at cost, like the Raspberry Pi foundation does. But it’s mainly for application development, since you don’t have headers to access the GPIOs. I will never understand why anyone would use Android for a media player. I mean do you seriously intend to watch movies with a taskbar and clock in the bottom of the screen? Then there’s the whole performance overhead of Android itself, poor UI for TV usage, lack of stock audio bitstreaming, etc. That GPU should be able to achieve much better than 37 fps for such a simple UI as shown in the XBMC video. They should focus on the Linux version of XBMC instead. Hopefully a quad-core at 2Ghz is enough for software decoding of all the other codecs as they only seem to support h.264 hardware acceleration. I have ordered a U2, will be interesting to see what i can do with it. It’s a nice price and all, but keep in mind that most would probably order it with a 9$ PSU, then comes storage: SD or eMMC, and the list goes on (wifi etc. ), in the end it really isn’t all that cheap compared to some of the chinese devices. Also the prices for U and U2 is $69 and 89$ respectively excluding shipping, not including as the text says. It seems to be a part number of processor… even I’m not sure. Why do you need the gigabit ethernet? Are you considering any cluster computing? From a technical standpoint, you’re absolutely right. XBMC UI get over 40 fps with Allwinner A10 in Linux. But it’s just so much easier with Android because the SoC vendors support it. You easily get 2D/3D acceleration because SoC vendors always provide up-to-date libraries and drivers for Android, and I understand there’s (more or less) a common video framework which make it easy to run an app accross devices. There are also some workaround to Android issues. You can provide a proper TV launcher for Android (IMHO this one looks good), there is a paid app (Hidebar) to remove the status bar, so it’s technically possible to do. The other thing is that Hardkernel has probably no intention to work on XBMC. They just want to show it works and the performance of their board. In Android, they just have to install the apk and it works, but in Linux, they would have had to spent a lot of time to make it work. Sorry, I read “Worldwide shipping” as “Free Worldwide Shipping” on the site, which is not the case, as there a $30 shipping and handing fee. I updated the post. The price is still competitive compared to other few quad core Chinese devices. Actually, I only know GK802/Hi802 freescale i.MX6 mini PC which sells for $89 (Charbax) and $99 (geekbuying), and Exynos is still a more power solution. I think the heatsink is needed when you do things that use 4 cores for an extended period of time (e.g. build), and when you overclock the processor up to 2GHz. It might also be useful for people working on the power management in the kernel. There’s also an heatsink on the ODROID-X board which can’t really be overclocked. According to their forum, it only has h.264 acceleration. They don’t have license to hardware decode anything else. This means software decoding for MPEG2 and VC1. It can probably handle software MPEG2 up to 1080p but not sure about VC1. There is also no working open-source VC1 decoder for interlaced content as you would find on Blu-Ray concerts, documentaries, etc. They should just sell optional codec licenses like the RPi does. Yes you are right. MPEG licenses are expensive and as this is officially a developers board, it has not been included. The RPi guys, did the same 😉 So I know for sure that the licenses can be bought in the future. One way or the other. 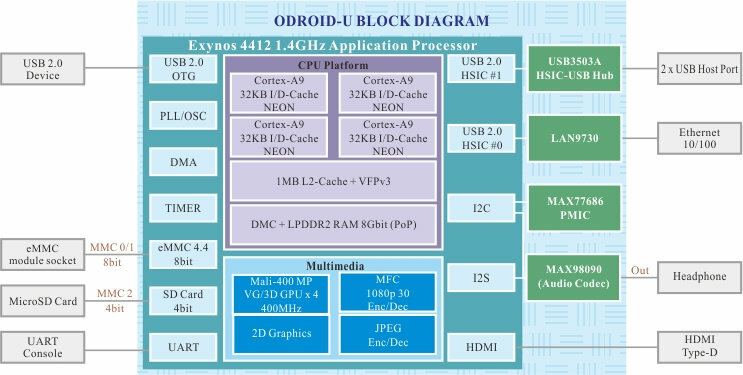 Those are possible features of the Exynos 4, not necessarily of this low-cost board. Most of the VPU’s require signed microcode of some sort to be uploaded before they decode anything. The insignal boards were generally more expensive than the hardkernel ones so maybe they include more codecs. Someone would need to confirm exactly what codecs are supported on both the Arndaleboard and this Odroid one. That’s one advantage of the Chinese products vs. Korean – Chinese don’t seem to care about licenses and their cheap SoC decode all video formats. ODROID-X boards are overclockable, some to 1.6 and some to 1.8. There are some statistics on their forum. It must be possible with some boards. But a few months ago, I asked Hardkernel if they had instructions to overclock the board, because I wanted to write a post about this, and they advised against it as they fried a few CPUs trying to do so. It’s possible there’s now a safer method, I haven’t checked. thankfully we have freescale and samsung who will hopefully make hacking these cheap chinese SOC boards all but practically irrelevant .. yay ! I am Ms. Nhung from VP9 company in Viet Nam.